I work at Hunterston A, which is a nuclear site located on a promontory of the Ayrshire coast, 30 miles south west of Glasgow. 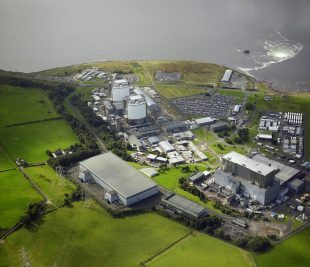 This twin reactor site was Scotland’s first civil nuclear generating station and, at the time of opening in 1969 was the largest in operation anywhere in the world. It ceased operations in 1989 after generating a total of 73 TWh. Unusually, Hunterston’s two reactors were constructed in an elevated position at a height of more than 10 metres, which enabled access from underneath. Gravity assisted removal of used fuel, and refuelling could be carried out without lifting machinery above the active core. The fuel elements were also unique, incorporating a graphite sleeve which was stripped from the irradiated uranium during discharge from the reactors, along with associated metallic components. 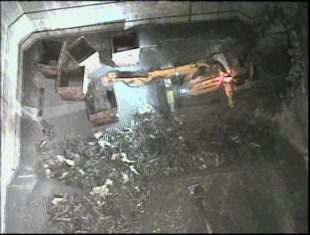 This Intermediate Level Waste (ILW) was transported via underground tunnels into one of 5 above-ground bunkers built between the 1960s and 1980s. Nearly 50 years after these 5 concrete waste bunkers began being built, I have been working as part of a team on emptying the second one. 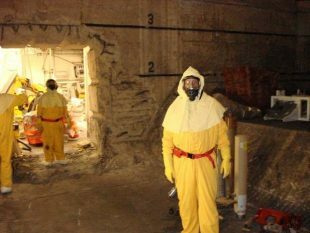 My team has now successfully emptied this bunker of its hazardous contents – 6 weeks ahead of schedule. Bunker 4 waste clearance nearing completion. We used remotely operated vehicles, lifting more than 650 tonnes of radioactive graphite and metallic waste, before packing into specially engineered stainless steel boxes. 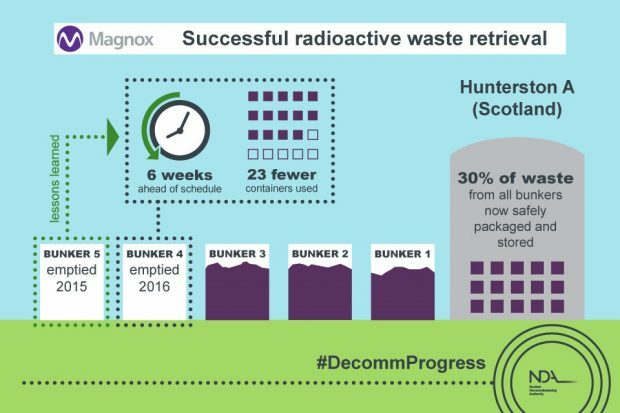 Hunterston holds the largest inventory of solid Intermediate Level Waste (ILW) in the Magnox fleet, accounting for more than 35% of the 7,500 cubic metre total. 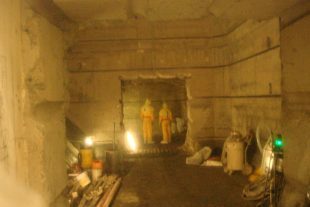 The Solid Active Waste Bunker Retrieval (SAWBR) Project was established to retrieve material and empty the bunkers in sequence (bunkers 5, 4, 3, 2, then 1) by breaking through the walls. We carry out the retrievals remotely, using Brokk vehicles to recover and load the contents into the boxes which are located inside a purpose-built facility next to the bunkers: the Packaging and Export Facility (PEF). We then transport the filled boxes, each 3 cubic metres in size, to the ILW store on site for future encapsulation. The first breakthrough came in 2014 at Bunker 5 which contained less waste than the others and was used as the active commissioning phase of the project. Overcoming the technical difficulties during this phase led to a consistent operating regime and improvements in throughput. Bunker 5 was cleared by February 2015, which was followed by another breakthrough to access the waste in Bunker 4. 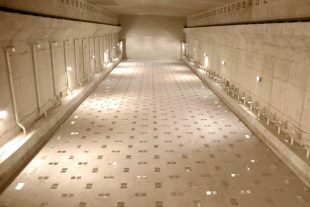 Benefitting from the earlier experience, significant improvements in the packing efficiency allowed Bunker 4 to be cleared ahead of programme, using 274 boxes – 23 fewer than the original projection. To date, 336 packages of solid ILW have been retrieved from the two bunkers, packaged and transported into the ILW Store, representing approximately 30% of waste in the five bunkers. Bunker 3 breakthrough is now almost complete and a return to waste retrievals is expected early July 2016. Eventually, the contents will be encapsulated in grout and then returned to the store for the decades-long Care and Maintenance phase.